There is a force to be reckoned with inside David Evans' tiny documentary “What Our Fathers Did: A Nazi Legacy,” a containment of the massively different convictions held by two dear friends. They are both the sons of senior Nazi officials, who were members of Hitler’s army that had firsthand involvement with the genocide of the Jewish people in the Holocaust, and whose faces and names appear prominently in historical documents. Their family history is connected directly to the atrocities committed by the Nazi party. On the other side of the argument is Horst von Wächter, a man of equal amiability in the film’s diner-conversation-level intimacy. For all of his life, Horst recognizes that terrible things have happened in Europe during the time of the Nazi regime, and is sympathetic to those who lost their lives or their lineages. But his own father, Otto von Wächter, who was ranked just a few notches below Niklas’, and was in charge of transportation to the concentration camps, is not directly responsible for the atrocities. That is at least from Horst’s perspective, who claims with an anxious tone that his father was a decent man. “He had no choice,” he states. The degree of his denial is disturbing, and provides the unmoving rock that makes “What Our Fathers Did: A Nazi Legacy” so poignant. The two men are brought together on this documentary occasion by an international lawyer, Philippe Sands comes from London but has his own personal history with the Holocaust—his family was nearly wiped out by the genocide, his grandfather having escaped. Sands is the writer and executive producer of this endeavor, but unlike many people who put together a documentary with their face on it, he does not seem concerned with presenting himself in a particularly great light, but in servicing his agenda—making Horst acknowledge the truth about his father, and renounce his love for his father. The key verb is “making,” as beyond screaming at him as you may want to when watching their nonetheless congenial interactions, Sands removes the distance between Horst and the truth. But the presentation, for example, of documents detailing von Wächter’s war crimes does nothing. “I have so many documents from people who knew him personally who said he was a decent character,” Horst deflects. “What Our Fathers Did: A Nazi Legacy” wields a power that towers above many other small movies. It may not be the large definition of cinematic, but it is still a true film. A fantastic scene involves the three men at a field where thousands of corpses are still buried. A single camera tactfully dances around them as they amble the disquieting space, the image aptly framed, on-the-fly, to maintain a breathless poetry (a triangle framing of the three men is particularly stunning). In other instances, over-the-shoulder shots are improvised, connecting an underlying idea from the film about what we see, as opposed to what we choose to believe. Evans’ film is a rare doc that gives its characters space within very personal moments, but is sharp on how to convey their poetry to an audience. Though emblematically stubborn in its form, “What Our Fathers Did: A Nazi Legacy” has an austere, gripping beauty that is often as sensational as it is reserved. It features personal footage not seen before of these men’s Nazi families, and an entire college course’s amount of essays about the psychology within a productive relationship to history, but it brandishes neither. And its centerpiece scene is one that like many of Sands' events, proves futile, but illuminates the magnitude within this story of three men talking. They are sitting at a speaking event, discussing their respective histories, but eventually the occasion takes its true shape of ganging up on Horst. Even the people in the audience try to crack him, but the opposing sides are merely talking at each other; Horst doesn’t budge. 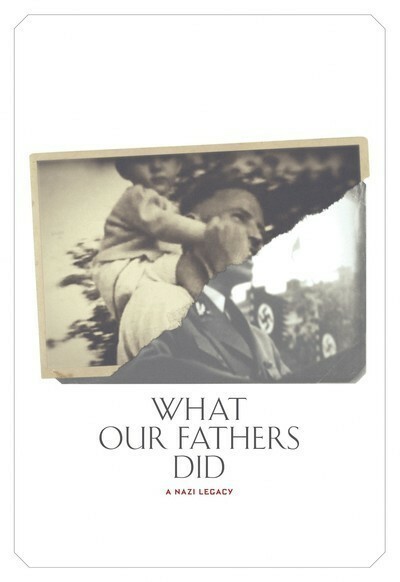 “What Our Fathers Did: A Nazi Legacy” doesn’t just look to the horror of not getting closure, but that of our convictions killing conversation.